Something else I’ve grown to dislike in CO. The community. Okay, I know the CO guys are sick and tired of hearing how the experience in Champions Online is second-rate to that of City of Heroes. Unfortunately it’s true. On multiple levels. 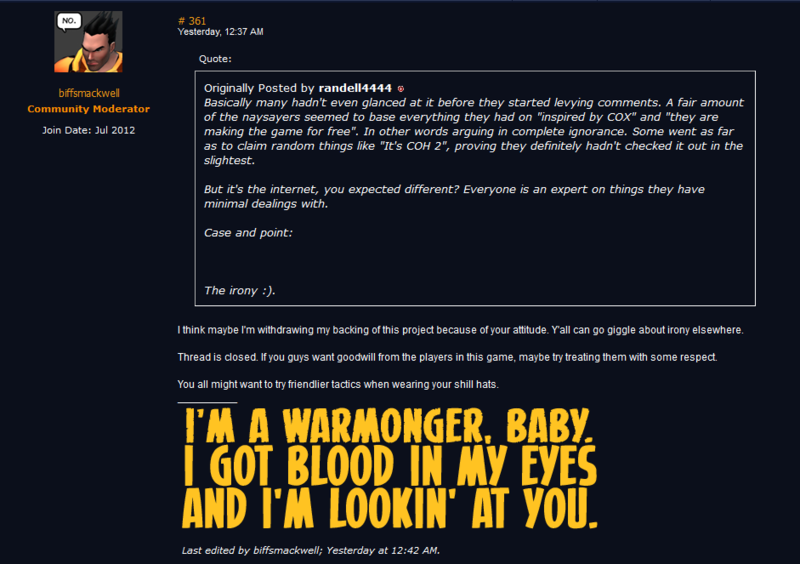 The image above is from one of the “community moderators” for the CO forums. Basically Perfect World/Cryptic devotes as few resources as possible to their online presence. So they don’t have paid staff doing forum moderation. They appoint ostensibly responsible, level-headed members of the community to police the boards themselves. And as you’ve guessed, it’s foxes guarding the hen house. The image above is a screencap of a thread closed down by one of the community mods. Now the thread he closed out was a long, and contentious one (in which he fully immersed himself). And, finally, when he tired of it, he basically used his mod powers to “get the last word” in an totally tact-free, class-free manner. And worse, this is normal tone for this guy! Yeah, CoH had it’s share of jerks as well. But they were never put in a position of authority over other players! This is part of what’s contributing to a completely toxic atmosphere, both on the boards and in-game. And, the game being four years in, and all but abandoned by the developer, it’s entrenched too deeply now to root out. As I’ve said all along, while CO isn’t CoH, it’s a decent game and worth saving. But not for people like this. And if you’re looking for a pleasant atmosphere that’s conducive to socialization, STAY THE HECK AWAY FROM CHAMPIONS ONLINE!